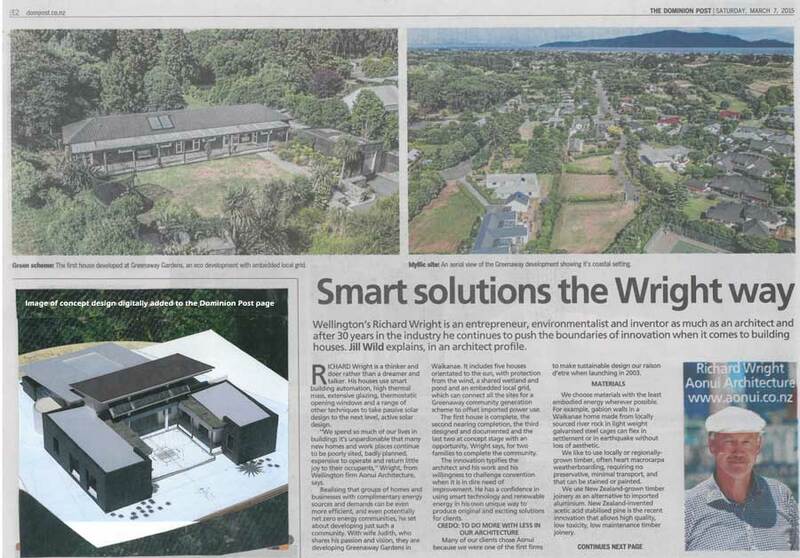 “Smart solutions the Wright way” says Dominion Post, 7 March 2015. Wellington’s Richard Wright is an entrepreneur, environmentalist and inventor as much as an architect and after 30 years in the industry he continues to push the boundaries of innovation when it comes to building houses. Jill Wild explains, in an architect profile. Richard Wright is a thinker and doer rather than a dreamer and talker. His houses use smart building automation, high thermal mass, extensive glazing, thermostatic opening windows and a range of other techniques to take passive solar design to the next level, active solar design. 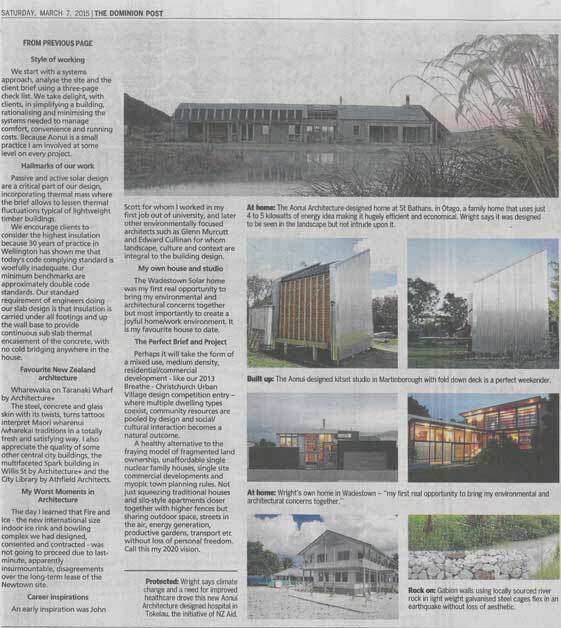 “We spend so much of our lives in buildings it’s unpardonable that many new homes and work places continue to be poorly sited, badly planned, expensive to operate and return little joy to their occupants,” Wright, from Wellington firm Aonui architecture, says. Realising that groups of homes and businesses with complimentary energy sources and demands can be even more efficient, and even potentially net zero energy communities, he set about developing such a community. With wife Judith, who shares his passion and vision, they are developing Greenaway Gardens in Waikanae. It includes five houses orientated to the sun, with protection from the wind, a shared wetland and pond and an embedded local grid, which can connect all the sites for a Greenaway community generation scheme to offset imported power use. The first house is complete, the second nearing completion, the third designed and documented and the last two at concept stage with an opportunity, Wright says, for two families to complete the community. The innovation typifies the architect and his work and his willingness to challenge convention when it is in dire need of improvement. He has a confidence in using smart technology and renewable energy in his own unique way to produce original and exciting solutions for clients. Credo: To do more with less in our architecture. Many of our clients chose Aonui because we were one of the first firms to make sustainable design our raison d’etre when launching in 2003. We choose materials with the least embodied energy wherever possible. For example, gabion walls in a Waikanae home made from locally sourced river rock in light weight galvanised steel cages can flex in settlement or in earthquake without loss of aesthetic. We like to use locally or regionally grown timber, often heart macrocarpa weatherboarding, requiring no preservative, minimal transport, and that can be stained or painted. We use New Zealand-grown timber joinery as an alternative to imported aluminium. New Zealand-invented acetic acid stabilised pine is the recent innovation that allows high quality, low toxicity, low maintenance timber joinery. We start with a systems approach, analyse the site and the client brief using a three page check list. We take delight, with clients, in simplifying a building, rationalising and minimalising the systems needed to manage comfort, convenience and running costs. Because Aonui is a small practice I am involved at some level on every project. Passive and active solar design are a critical part of our design, incorporating thermal mass where the brief allows to lessen thermal fluctuations typical of lightweight timber buildings. We encourage clients to consider the highest insulation because 30 years of practice in Wellington has shown me that today’s code complying standard is woefully inadequate. Our minimum benchmarks are approximately double code standards. Our standard requirement of engineers doing our slab design is that insulation is carried under all footings and up the wall base to provide continuous sub slab thermal encasement of the concrete, with no cold bridging anywhere in the house. Wharewaka on Taranaki Wharf by Architecture+. The steel, concrete and glass skin with its twists, turns and tattoos interpret Maori wharenui /wharekai traditions in a totally fresh and satisfying way. I also appreciate the quality of some other central city buildings, the multifaceted Spark building in Willis St by Architecture+, the City Library by Athfield Architects. The day I learned that Fire and Ice – the new international size indoor ice rink and bowling complex we had designed, consented and contracted – was not going to proceed due to last-minute, apparently insurmountable, disagreements over the long-term lease of the Newtown site. An early inspiration was John Scott for whom I worked in my first job out of university, and later other environmentally focused architects such as Glenn Murcutt and Edward Cullinan for whom landscape, culture and context are integral to the building design. The Wadestown Solar home was my first real opportunity to bring my environmental and architectural concerns together but most importantly to create a joyful home/work environment. It is my favourite house to date. Perhaps it will take the form of a mixed use, medium density, residential/commercial development – like our Christchurch Breathe-Urban Village design competition entry – where multiple dwelling types coexist, community resources are pooled by design and social/cultural interaction becomes a natural outcome. A healthy alternative to the fraying model of fragmented land ownership, unaffordable single nuclear family houses, single site commercial developments and myopic town planning rules. Not just squeezing traditional houses and silo-style apartments closer together with higher fences but sharing outdoor space, streets in the air, energy generation, productive gardens, transport etc without loss of personal freedom. Call this my 2020 vision.